Make a bold statement with our Red Competition Tire Jump. Not only is this tire jump attractive, it is made to the specifications required by most trial organizations. The Tire is made of hollow plastic tubing, attached at the top with chain, and held secure to prevent rocking with a sliding shock-cord support. By simply unclipping the top of the chain and moving the tire up and down, you can quickly adjust it to any height. There are preset height positioning eyebolts that allow you to quickly adjust the height of the tire. 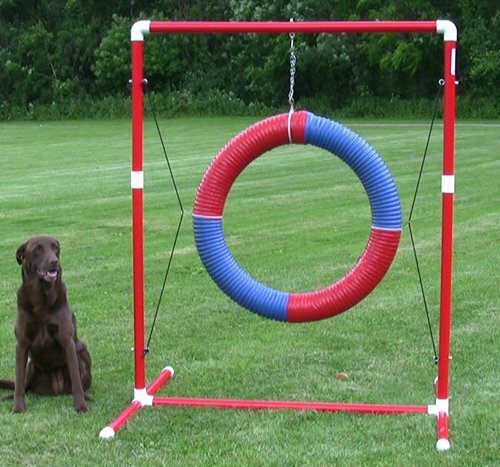 There are fixed positions for every jump height in the AKC, USDAA, and CPE venues. There is some simple assembly required. The tire will come straight and undecorated. We include colored duct tape for you to wrap it yourself and easy instructions for assembly!